A guest post by the winners of the 2018 Hult Prize at Penn. The Mack Institute sponsored the team’s participation in the regional competition in March 2019. Our unforgettable journey to Boston started back in October 2018 when Peter, who would become our team captain, came across a post about the Hult Prize in a student newsletter. Sometimes called the “Nobel Prize for Students,” it’s an annual competition that crowdsources ideas from MBA and undergraduate students to address a pressing social issue. Past topics have included food security, water access, energy, and education. After a multi-round process that includes six weeks at a rigorous accelerator program in London, the winning team ultimately receives $1 million USD in seed capital to launch their enterprise. With a long-standing passion for social entrepreneurship, Peter immediately identified the Hult Prize as a perfect avenue for him to gain more experience in this space. Noticing that past teams with greater diversity generally had more success in the competition, he recruited Henry, a freshman majoring in architecture who is an experienced graphic designer; Connie, a Wharton junior with expertise in marketing and business strategy; and Jennifer, a Wharton junior concentrating in finance. Our strengths, together with Peter’s computer science background in software development, constituted a comprehensive set of skills required for a social venture. With this year’s prompt to solve youth unemployment, our team took on the challenge to build a venture that will provide meaningful work for 10,000 youth within the next decade. Inspired by our shared experience of receiving life-changing mentorship along our way, we came up with our venture, PEER, which is essentially a peer-to-peer online platform that matches underprivileged youth with current college students of similar backgrounds who can provide accessible and tailored advice. Not only do we hope to tackle youth unemployment by creating job opportunities for the college students who serve as mentors, but more importantly, we hope to empower underprivileged youth through educational and career guidance, helping them break out of the poverty cycle and attain upward mobility. We competed in the preliminary round at Penn in December last year. While we were thrilled to present our business idea for the first time, we also felt very anxious about the feedback we would receive. When we heard that we had been selected as the winner, we were all exhilarated. “I could not believe we won!” Connie exclaimed about the moment the results were announced. “It was truly humbling to listen to all the inspiring ideas that the other teams had come up with. I felt so grateful for the constructive feedback the judges and our peers gave us which enabled us to refine our idea and better prepare for the next round,” she reflected. 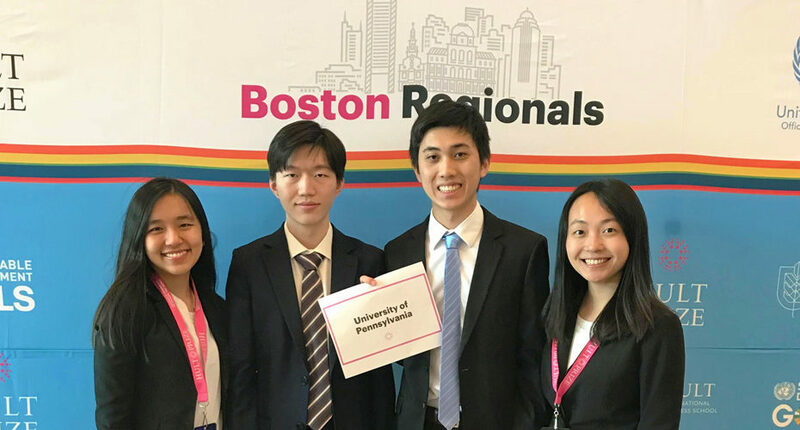 Four months later, we set off together with the support of the Mack Institute for the next round — the Boston Regionals, held at the Hult International Business School. 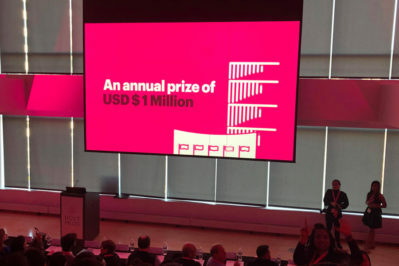 Winners of the regionals would have the chance to continue on competing for entry in the accelerator program in the U.K. and the finals at the United Nations. With more than 30 teams participating, the regionals offered a unique opportunity to meet like-minded students with diverse ideas from other universities. On the Saturday of the competition, the participating groups took turns presenting to judges in different rooms. Confident but hushed voices filled the hallways in the venue as groups nervously rehearsed their speeches in their own breakout rooms. We were fortunate enough for the chance to sit in and listen to other six groups pitch their ideas in the morning, and our minds were blown! The ideas ranged from a Tinder-like app pairing disconnected youth with seniors in need of care, agricultural technology in Ghana, to 3D-printed prosthetics. Each group came in confidently and presented passionately about their vision. After the presentations, those of us in the audience had the chance to voice our thoughts to the judges. We discussed each idea’s market potential, cost-effectiveness, regulatory barriers, feasibility, and so on. It emphasized to us how many different aspects had to be taken into consideration to ensure that an idea would work. “I felt lucky to present in the afternoon session because we now knew what kind of questions to anticipate from the judges,” remembered Jennifer about our experience watching the morning session. After making our pitch in the afternoon, the competition proceeded to the final round in the evening where we anxiously awaited results. Unfortunately, given the intense competition, we were unable to progress into the finals. We definitely felt disappointed, but as we listened to the pitches presented by the finalists, we became aware of the areas where we could improve. Our disappointment soon turned into a glad realization that we were only at the very beginning of our journey. With what we learned from the competition, we are off to a great start. We were also inspired by the winning teams and their unique ideas such as recruiting veterans as gym coaches or utilizing underused kitchens in the community centers to provide quality meals for the poor. We walked away from the competition with the message that challenges are inevitable, but it’s the mindset and method with which we tackle these challenges that really define who we are as entrepreneurs.